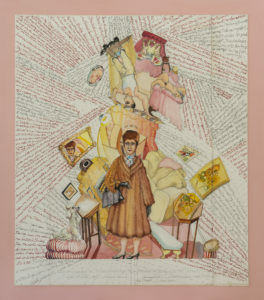 …is the title of a charming show by academician Anthony Green at the RA until 30th April. In the Tennant Gallery on the first floor, it takes up but a single room. Miss Dupont was Madeleine Dupont (1910-2005), Green’s mother – the artist always focuses on subjects from his own life. The works were inspired by her second marriage, to Stanley Joscelyne, as seen through the eyes of her, then, thirteen year old only child, Anthony. This is a joyous and celebratory show, which repays close attention. 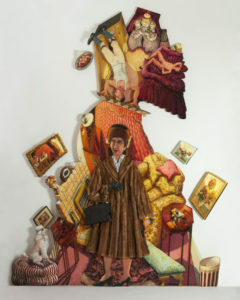 At its centre is a three meter high painting (above) of Miss Dupont, in mink coat, silk scarf and with handbag entitled The Fur Coat: “Hazana” (2005-2014) which has never been exhibited before (though it includes a fragment of an earlier work). Each element of it is meaningful, from the picture of sunflowers on the right – representing Anthony’s schoolboy attempt to replicate Van Gogh’s Sunflowers – to the poodle, Peter, bottom left, Stanley’s dog from his life before Miss Dupont. The items of furniture were all from the Joscelynes’ home in Friern Barnett. Both parties to the second marriage were escapees from a previous, intolerable union, although it is made clear that Madeleine loved her former husband, Anthony’s father, though life with him was unhappy as he drank more and more. Stanley’s former wife was also an alcoholic and abusive. 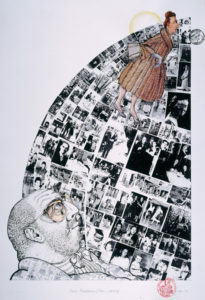 The water-colour The Second Marriage/The Fur Coat (2005) which was a preparatory piece for Hazana, is reproduced as a poster on the inside of the programme, which visitors are encouraged to take away with them. I still have mine and have enjoyed reading it. The script includes explanations of some of the items included in the drawing and the final painting as well as extracts from documents – Miss Dupont’s Decree Absolute, telegram and letters from her french family and friends, a letter home from young Anthony, away at school. The work captures this ‘second chance’ at marriage and the participants’ determination to take full advantage of it, living this new life exhuberantly and well. Anthony seems, after a period of adjustment, to have got on with his new step-father, helped along by Stanley’s ability, at the drop of a hat, to stand on his head. Miss Dupont died in 2004 and, one assumes, this occasion prompted Green to begin the work which became Hazana. 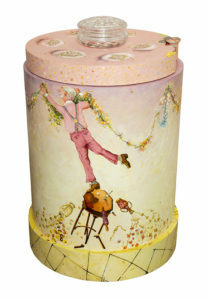 The exhibition includes a three-dimensional painted drum as a stand for a crystal bowl entitled Madeleine’s Ashes, the Crystal Powder Bowl, a Memorial (2015-17) and an etching called Marie Madeleine (1910-2005) showing photographs from her life as she ascends, be-winged (?). I hadn’t known much about Anthony Green before coming upon this exhibition, which celebrates forty years since his election to the RA, but I will look out for him in future. For those who are similarly interested there is a book Anthony Green: Painting Life, with text by Martin Bailey and fully illustrated at £29.95. Entry to Miss Dupont is free if you have a ticket to another exhibition, or £3 for a general admission ticket. Find out more about the exhibition on the RA web-site. This entry was posted in Art, Culture Vulture, London and tagged London, Worth a visit by juliej. Bookmark the permalink.